The Frenchman is currently serving a six-year ban. MICHEL PLATINI, THE suspended Uefa chief, arrived at the Court of Arbitration for Sport in the Swiss city of Lausanne this morning to appeal his six-year Fifa ban for ethics violations, with his future in football hanging in the outcome. “Today the match begins, a new match, the final, and we are all on the same page. I’m optimistic, we’re going to win,” Platini told reporters. The stakes could not be higher for the 60-year-old former Juventus star and suspended head of Uefa. A favourable verdict and he will take his place in the stands at the Stade de France for the Euro 2016 opener between hosts France and Romania on 10 June. A negative verdict will mean he will be barred from entering the national stadium, his glittering career in the sport having come to an ignominious end. The Frenchman has been sanctioned over an infamous two million Swiss franc (€1.8 million) payment he received in 2011 from then-Fifa president Sepp Blatter. The affair has already cost him a shot at becoming head of world football as he was forced to pull out of the race to become Fifa president in an election won by his number two at Uefa, Gianni Infantino. Platini’s entourage is hoping for a decision “before May 3″ when Uefa holds its congress in Budapest. Blatter, who is due to testify Friday, has also appealed to CAS and is awaiting a date for his hearing. Today’s Lausanne-based tribunal will be in session until around 3pm Irish time. 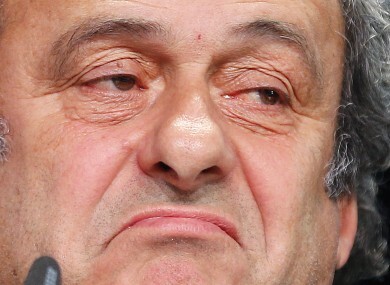 ”This is the last avenue of appeal,” Platini’s lawyer Thibaud D’Ales conceded to AFP. The CAS consists of three legal experts, one each representing Platini and Fifa and a president. Platini has chosen Yale and Harvard educated Swedish lawyer Jan Paulsson, with world football’s ruling body selecting Bernard Hanotiau of Switzerland. As part of his defence Platini’s legal team will produce an invoice for the suspect payment in an attempt to prove there was nothing untoward about the transaction. “Five people from the offices of Fifa were involved in this payment, which was processed by the Finance Committee and reported to the Executive Committee. It is far from a hidden payment,” said D’Ales. Platini’s name has also emerged in the Panama Papers, a leaked set of 11.5 million documents that provide detailed information about more than 214,000 offshore companies listed by the Panamanian corporate service provider Mossack Fonseca. But D’Ales denied this had any relevance to Friday’s hearing. Email “'Today the match begins, a new match, the final': Platini in court to appeal ethics ban”. Feedback on “'Today the match begins, a new match, the final': Platini in court to appeal ethics ban”.